The Downfall Dictionary: William Lorimer: the fall of the "blond boss"
William Lorimer had served about a year in the United States Senate before he was put on the defensive. Openly referred to as the "blond boss" of Chicago, Lorimer maintained his innocence through three inquiries into whether he had been fairly appointed to his seat. Though he had always been popular in his home district, perhaps by enforced methods, it did little to help him on the national stage. Lorimer was born in Manchester, England in 1861 and came to the United States with his parents when he was five years old. The family moved to Chicago in 1870, and Lorimer entered a variety of low-level jobs. Most sources say he worked as a newsboy, a bootblack, and in the city's packing houses. Others include titles as laundry solicitor and department store cash-boy in the list. Lorimer was able to lift himself into city politics when he was still very young. After landing a job as a streetcar conductor, he organized the Street Railways Employees' Benevolent Association and was elected constable in 1886. Dabbing in real estate and construction work, he was named assistant superintendent of water main construction the next year and superintendent of the water department soon after. His first stab at elected office, a race for a superior court clerk's position, was met with failure in 1892. Two years later, Lorimer set his sights higher and ran as a Republican for the House of Representatives. The Chicago Journal did not spare words in their opinion of the burgeoning boss's fitness for office: "His only demonstrated qualification of any kind is a 'pull' in Democratic wards," the paper stated. "He knows considerable about carrying primaries, but he knows no more about political, industrial, or social subjects than does a hole in the ground which doesn't care what goes down it." Lorimer's working class background and lack of serious education may have been seen as drawbacks. But his political machine, which exploited the largely illiterate immigrant population, organized wards in the city and Cook County, and promised rewards of public grants and contracts, probably helped with his election to the House. Lorimer was returned to the House in 1896. The New York Times quoted him as saying in the month after the election that he would "quit politics for good" after casting a vote for Speaker of the House and a tariff bill. There was also speculation that he would run for mayor of Chicago. Neither turned out to be true, as Lorimer went on to win re-election in 1898 with the help of a circus-like campaign, where large tents were set up with music and political jokes. 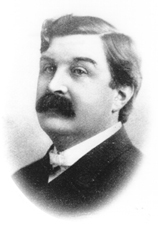 In 1900, Lorimer failed to win re-election, but came back in 1902. In a glimpse of things to come, his Democratic opponent charged that questionable tactics had been used in the race; however, Lorimer was able to keep the seat and win the next four elections. In January of 1909, the Illinois legislature took up deliberations to choose a senator, as the term of Republican Senator Albert Jarvis Hopkins was set to expire in March of that year. The matter soon became a protracted battle, as Hopkins was able to come within 20 to 30 votes of confirmation but never achieved the majority needed to break the deadlock. Lorimer's name was not introduced into the process until much later, when a single vote in favor of him on one ballot hinted that he might be under consideration. On the legislature's 95th ballot, Lorimer was appointed senator after 108 members (55 Republicans and 53 Democrats) voted in favor of him. Ninety legislators were opposed. The confirmation was not without incident; U.S. District Attorney and former Illinois Lieutenant Governor William A. Northcott was escorted from the floor by policemen after lobbying on behalf of Hopkins. Democratic state representative Lee O'Neil Browne took offense when another legislator insinuated that improper means had been used to attain the result. "I do not know what the gentleman means, but if he means that improper influences have been used then he is a liar," said Browne. "I hope he did not mean it. But if he did and will repeat his words to me outside of this hall I will pledge you that one of us will never make those remarks again." When the vote was taken, the New York Times referred to Lorimer as an "ex-boss," since his ally-turned-rival Charles S. Deneen had brought together enough factions to win the state's gubernatorial race in 1904. However, the paper also mentioned that he remained strong in his own district. During the 61st Congress, which stretched through the deliberations of the Illinois legislature, Lorimer chaired the Committee on Expenditures in the Department of the Navy. Entering the Senate in June of 1909, he chaired the Committees on Mines and Mining as well as the Pacific Islands and Puerto Rico. In April of 1910, the Chicago Tribune published a confession by Democratic state representative Charles A. White that he'd received $1,000 to vote for Lorimer during the Illinois legislature's debate. White said he'd also gotten $900 out of a "jackpot" used to influence the nomination process once the legislature had closed its session. Over the course of the next month, two more Democratic representatives said they had also been bribed, and a state senator said he'd received $2,500 for his vote. Though the confessors charged two other legislators in the matter as well, they all agreed that one man was the principal actor in the scandal: Browne, the Democratic leader of the lower house who had so pugnaciously denied any wrongdoing the previous year. Lorimer, of course, denied the accusations and said they were part of an attempt to undermine the La Salle Street Trust and Savings Bank, which he had started in 1910. The Tribune reported in July that a vote-buying scandal may have been playing out on both sides: another plan had allegedly been in the works to buy 17 Democratic votes for Hopkins at $2,000 a pop, but the plot was aborted by the Speaker of the Illinois legislature and the state's Democratic National Committeeman. Both men denied there had ever been such a scheme. In September, Browne was acquitted on bribery charges after two trials. Lending a boost to the scandal's publicity was a very high-level snub of Lorimer in September of 1910. Ex-President Theodore Roosevelt, noting that Lorimer was to be a guest of honor at a dinner of the Hamilton Club in Freeport, Illinois, said he would not attend if the accused senator would be there. Lorimer's invitation was immediately withdrawn, and Roosevelt's speech at the dinner blasted government corruption. In the Lorimer case, he implicitly expressed his belief that Lorimer was not entitled to the seat by saying, "I defy any honest man of intelligence not to come to the conclusion that the Legislature whose doings have been exposed was guilty of the foulest and basest corruption and, therefore, of the most infamous treason to American institutions." The Senate Privileges and Elections Committee investigated the matter in September and October, and in December issued the determination that the bribery was not enough to take away Lorimer's majority in the legislature's vote, and thus he had been fairly elected. A minority report in January of 1911 said the senator was not entitled to his seat, and Republican Senator Elihu Root of New York criticized the majority conclusion as faulty. It didn't matter that Lorimer was not personally involved in the bribery, said Root, and it was not the committee's job to determine whether the Tribune had made a solid enough case; in the end, the election was fraudulent and Lorimer did not have the right to be in the Senate. Root was not able to outshine Lorimer's memorable three-hour speech, which he made in the Senate in his own defense that same month. Lorimer recalled his poor upbringing, and credited the numerous relationships he had forged in Chicago over the years as the reason for his popularity among Democratic state legislators. He had helped one legislator get an appointment so he could care for his sick wife, he said; another was an associate of a former newsboy whom Lorimer had befriended in his youth. Democrats also supported his efforts to create a waterway from Chicago to the Mississippi River, he argued. When the Senate took up the issue in March, they voted 46-40 that Lorimer had been duly elected. Meanwhile, the Illinois state senate had begun its own investigation in January of 1911. The biggest revelation of this effort was the discovery of more information on the "jackpot" fund that was used to elect Lorimer. Clarence S. Funk, general manager of the International Harvester Company, said Chicago lumber magnate Edward Hines had asked him to chip in $10,000 toward a $100,000 fund set up for Lorimer's appointment. The senate concluded in a 39-10 vote in May that Lorimer had not been fairly elected, and in June the legislature sent a resolution to the Senate asking for the investigation to be reopened. Some members of the Senate had been keeping an eye on the Illinois legislature's work, and had already gotten that idea. In April, before the legislature had even issued their conclusion, Republican Senator Robert La Follette asked for the case to be reopened. In June, a select committee of eight senators from the Committee on Privileges and Elections was appointed to look into the 1909 appointment. Cyrus McCormick, President of the International Harvester Company, confirmed Funk's story to the committee. The members also heard accusations that Hines had bragged about getting Lorimer elected as a way of keeping a high tariff on lumber. Hines was alleged to have said that the appointment "cost us a lot of money, but he is well worth it to all of us." Edward Tilden, President of the National Packing Company and a bank director, was accused of collecting contributions to recoup the Lorimer backers. Hines, in his testimony before the committee, threw some blame on President Howard Taft, saying he had urged support of Lorimer in order to have his vote in favor of the Aldrich-Payne tariff bill; Taft issued a denial of the accusation. When the investigation concluded in February of 1912, five members of the committee concluded that Lorimer could keep his seat, while three were against it. Despite this finding, Lorimer was on much shakier ground following this third investigation. The alleged corrupt vote count from the legislature's 1909 action was up to 10: enough to have affected the final tally. Vice President James Sherman even asked him to resign, saying it would spare the Republican Party serious ill effect before the presidential election later in the year. Lorimer refused. "I was elected to the United States Senate honestly, and I would rather stand up and be counted out by my colleagues than to yield to any pressure to resign under fire," he said. The Senate debate on the issue took place in June and July to allow the primaries to take place during the spring. Lorimer went on the offensive while speaking on his own behalf in July, criticizing senators who had been seeking his resignation and accusing the Chicago newspapers of turning public opinion against him. The "trust press," he said, did not pay their fair share of taxes. He charged Governor Deneen with taking more in fees than he deserved. He said Taft had treated him poorly, though the President apparently only remarked that he hoped the Senate would vote on the side of honesty and decency in the matter. Recalling Teddy Roosevelt's statements in 1910, Lorimer said, "He wants to get rid of the bosses. He doesn't want them on his side--especially if the people know him." Soon after, the Senate voted 55-28 that "corrupt methods and practices were employed in [Lorimer's] election, and that the election, therefore, was invalid." Thus expelled, Illlinois went on with one senator until March of 1913, when Republican and former Illinois Lieutenant Governor Lawrence Yates Sherman was elected to replace him. Lorimer's troubles were not quite over. In 1914, the La Salle Street Bank and Trust failed, and Lorimer and other bank officials were indicted on charges that they misappropriated funds. Of the hundreds of thousands of dollars lost in the collapse, Lorimer was accused of making off with $70,000. He was acquitted after a trial, but the bank's vice president, William B. Munday, was convicted and served part of a prison sentence. In 1923, the indictments against both men were withdrawn. Though he expressed interest in returning to Congress in 1916 and 1919, Lorimer's time in government was over. He returned to private business, getting involved in the timber industry and representing an American syndicate advocating railroad concessions to South America between 1921 and 1924. He did go to Washington again in 1927 to speak on behalf of the waterways issue he had consistently advocated, and in 1928 appeared in Congress on a flood control issue. He was met with some hostility by Congressman John Schafer, a Wisconsin Republican, who said Lorimer had been expelled from Congress and that his lumber company owned land in the area where the government could potentially buy up floodplains. Lorimer said he owned 1,000 acres in the area, but would be willing to give up the land rather than sell it. In 1934, Lorimer collapsed in a Chicago railroad station, dead of a heart condition.